#1 How common is bloat in puppies and how should I be careful? I feed him kibble soaked in warm water for 2-3 minutes before draining the water and adding supplements. The breeder told me I shouldn't carry him and play with him after meals to avoid tummy problems but how long should I wait? Sometimes he looks at me bored and I'm not sure if I should play with him or wait awhile more. #2 He's running a flu at the moment, sniffing non stop and sneezing but he refuses to eat his medicine. He won't open his mouth when fed through a syringe and if I add it to his food he ignores the food. #4 He does the nipping/play biting thing and thinks fingers are chew toys. He doesn't show much interest in his toys -- It's a 5 minute oooh new toy then ignores it thing so apart from telling him "NO" then ignoring him what else can I do to make him comfortable since he's teething after all? He pretty much toilet trained himself and has been a dream to watch except for the health concerns. I'm a new chow owner so I don't really know what I should watch out for? Is there anything else I should be concerned about? Ps ~ Your breeder is wrong. You can totally play with your puppy after it eats. If any my 2 chow chows are the most playful after they eat!!! They get the zoomies where they run around the whole house. Don't worry you won't give him bloat! Sorry, but I am going to be a lot more critical than chowchowmomma was. 1st off, why would you accept the puppy with so many obvious health issues. If you are completely dedicated to the pup, then you should have a vet of your choosing examine him immediately. You should NOT rely on what the breeder told you or any existing medications. With any standard sale contract you have a health guarantee. A pup at that age with those problems already is likely to have continued issues. You will want to be informed on what they might be and how expensive a prospect you are looking at. Seriously consider where you got this pup from. It doesn't sound great. Did you research the breeder or check any references? The breeders advice on contact after eating is dead wrong and sounds like they are trying to hide other problems. Bloat can be an issue with chows, but its not something that should be an everyday concern. If the dog really requires the medicine for the flu symptoms and wont take it, a vet is the best option as they can administer is intraveniously. I would be very worried about an undefined rash. You need to know what it is to treat it properly. It could simply be hotspots (but I doubt it in that young a pup), or it could be a contagious strain of mange. Skin lesions (rashes) can also be the result of some parasitic infestations. I would really want to know if direct contact with the dogs skin could be a risk. Are you applying the ointment using surgical gloves? Hydrocortisone is a steroid hormone treatment and is used in a wide array of diagnosis', but most commonly used as an anti-inflammatory for allergic reactions. So, likely the dog has been diagnosed with some allergies. Since you don't know what those are (food, environment, etc) it will be hard to resolve the underlying issue. The ointment is not usually applied to any open sores, so you should have been instructed on that. Doesn't sound like you got a ton of support from the breeder. I would bring the pup to a respected vet, who has experience with Chows ASAP. Sadly, from the sounds of things you are probably looking at an expensive visit. And I hope I am wrong, but I would expect that to continue for at least a while. I've brought him to the vet last wednesday and she shaved him down for the skin, he got injections and various other medications for the flu. Thank you guys so much for the help, but right now it doesn't look like it's distemper. As for the skin he did a microscopic skin scrape and no mites were found. He has a followup visit with the vet on wednesday will check again with her. His breeder said he has previously done a health check and has no existing health conditions. Should I take his word for that? Right now he is eating his medicines, but I see only minor improvements. Skin appears to be slightly better too. While I'd agree that I haven't gotten a lot of help from the breeder I feel its more of inexperience than unethical. I should have accepted a healthy pup but I did fall hard for him the first time I saw him so regardless of his health issues, he's mine, and I'd fork out as much as needed for him to be okay. Also, I have another question. Will get the vet to do a thorough check up for him this wednesday. I certainly can understand falling for a certain pup within the litter. Rory is our 4 year old male, and he was selected 100% because he nuzzled up to my wife and they formed an instant bond. He has ended up being the best of any of the Chows we have ever owned. We decided to show him because we thought he was a handsome dog. The breeder has repeatedly made excuses for that dog and said she wouldn't have picked him for us if she knew we were going to show him...he has earned his ACK CH designation, is 1/2 way to a GCH award, and was ranked at high as 20th in the US among show Chows this year. 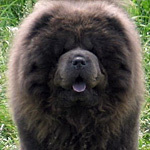 And he has the best personality/behavior I have ever seen in a chow. I think that is really due to him being the right dog, in the right place. To this day, they still have a fantastic rapport. He is an absolute delight. When we got our female from the same breeder, she 'recommended' Amber as the best show potential dog in that litter. She is a nice dog. Has a sweet temperament, but a ton of quirks. She hated the showing aspect, and is retired at just over 2 years of age. We don't force it on the dog if she doesn't like it. So, I really do get picking the dog, or the dog picking you. But, I wouldn't think that any of the other dogs from that breeder were free of the issues you have experienced. And I applaud your dedication to getting a healthy dog. As for the breathing...Chows can be vocal without actually barking. Some call it 'chuffing', similar to what a tiger will do, or a cats purring. It may not be a breathing exercise, but a communication. You would have to pay attention to when it occurs to say for sure. Best of luck with the vet visits. Hopefully you get good results.